Footprints Family Centre support families balancing their commitment to work with their need to care for children through Primary School years as well. We collect children from local Primary Schools in the BD6 area. Below is the current list, but do talk to us if your child’s school is not listed as we may be able to help. 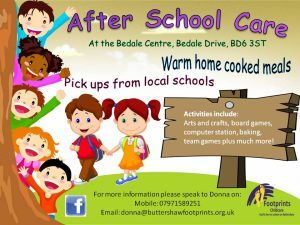 Children are brought back to the Bedale Centre (BD6 3ST) either on our minibus or on foot if the school isn’t far. The afternoons activities are led by experienced and qualified staff who play games, lead activities and eat an evening meal together as well. During Holiday periods we provide a wide range of holiday activities and all day care. Call Donna for more information on 07971589251, email donna@buttershawfootprints.org.uk or visit our facebook page https://www.facebook.com/ooscFP/. Term time, we are open from 3pm until 6pm. During Holidays, we are open from 7.45am until 6pm. Copyright © 2019 Footprints Childcare. Powered by WordPress. Theme: Esteem by ThemeGrill.